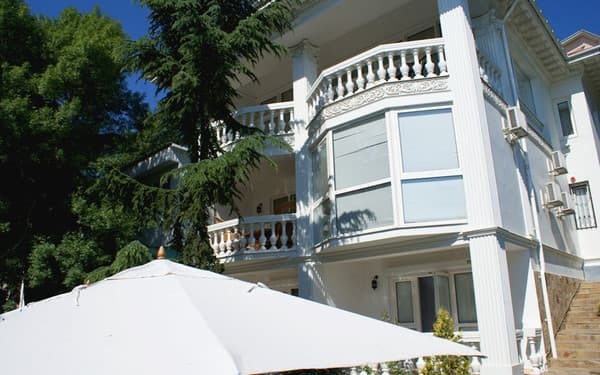 Villa "Olga" is located near the embankment of the Professor's Corner. 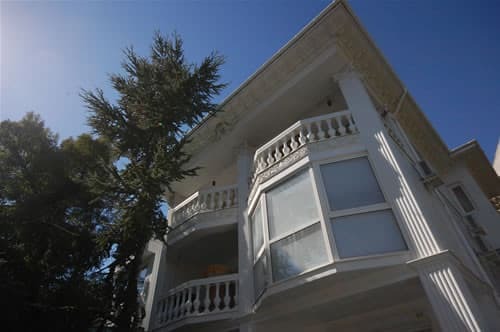 The white, three-story building is built in a palace style and looks great surrounded by greenery and other small private villas. 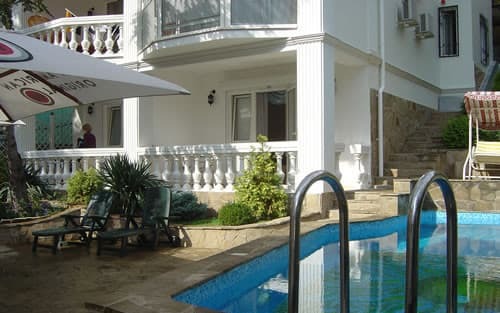 The villa is located at the foot of Mount Kastel, just 150 meters from the waterfront. The architecture of the building is made in a classical style. Here the guests are offered VIP-class rooms with all the services required for a wonderful holiday. On the territory there is a swimming pool, a small garden and a terrace. Free Wi-Fi and parking are available. At the villa you can hold a meeting, a conference, a corporate party. In such a situation, a business meeting with important partners will improve the image. 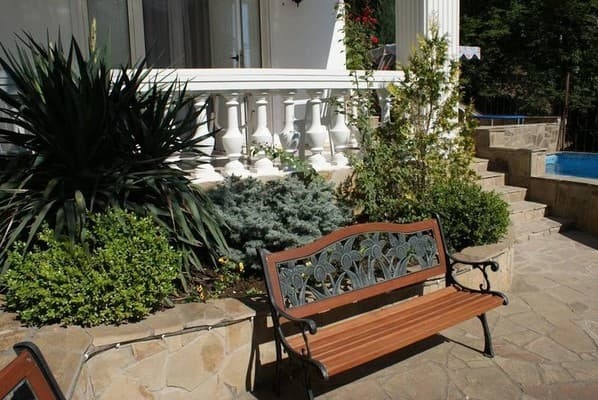 The attentive staff will help you to feel the charm of the summer holiday at Villa "Olga". PRICES MAY CHANGE, YOU NEED TO RECEIVE INFORMATION FROM THE OPERATOR! Description of the room: First level. 2 rooms of the class Junior suite: 2 guest bedrooms with separate entrances, terraces and bathrooms. Second level. Luxury room: Bedroom with living room, large balcony, bathroom, fireplace. Kitchen - dining room with bathroom. Third level. 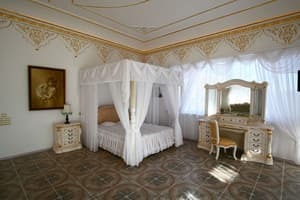 VIP room: Spacious, bright apartment with sleeping and living area decorated in Moorish style, terrace and separate bathroom. Can accommodate up to 8 people, with extra. places in all up to 12 people. 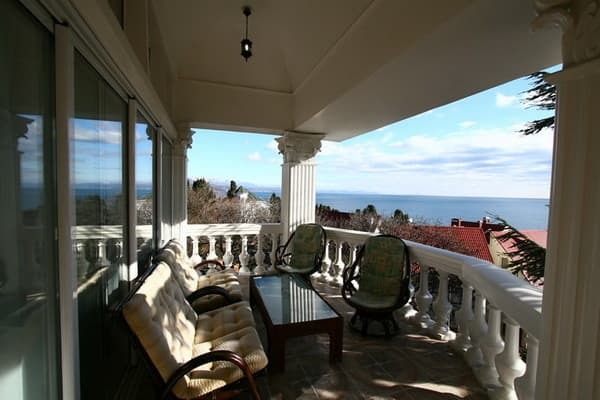 Villa "Olga" is located near the embankment of the Professor's Corner, just 150 meters from the waterfront. By bus or shuttle bus from. the railway station or the airport of Simferopol to the bus station of Alushta (the journey time is 1 hour 30 minutes). Next taxi on the street. Putsatov 7a.